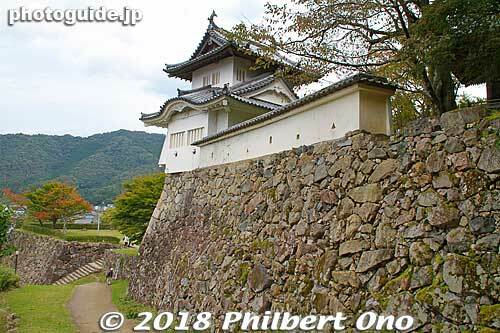 In Oct. 2018, I visited Toyooka, Hyogo Prefecture for the first time. 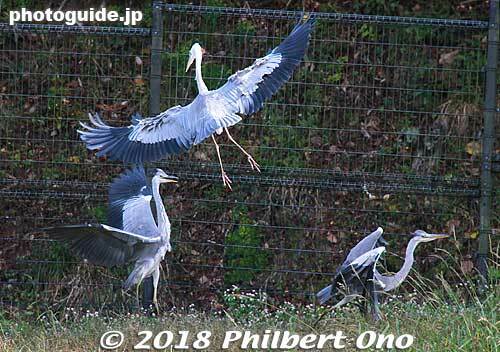 Famous for the Oriental white stork, Toyooka turned out to be a great tourist town with lots to see besides the beautiful storks. 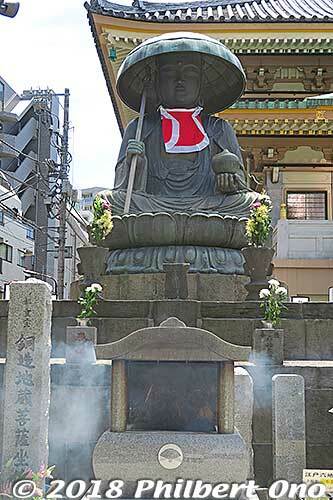 Toyooka is about a 2.5-hour express train ride north of Osaka or Kyoto Station. 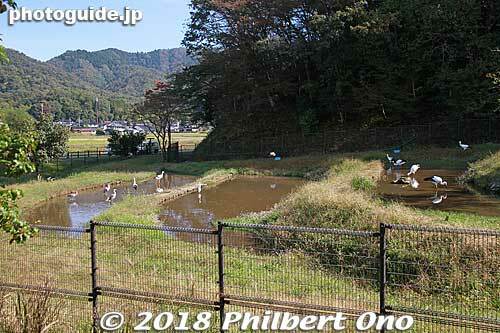 The Oriental White Stork Park is in the middle of rice paddies near some mountains. It is a bird sanctuary, college research facility, stork museum, and tourist attraction (gift shops). 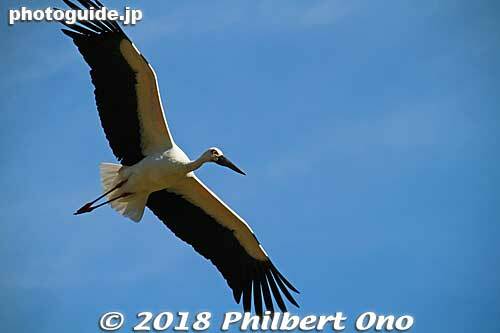 Once found all over Japan, the Oriental white stork (“kounotori” in Japanese) became extinct in the wild in Japan in 1971 despite preservation efforts since 1955. 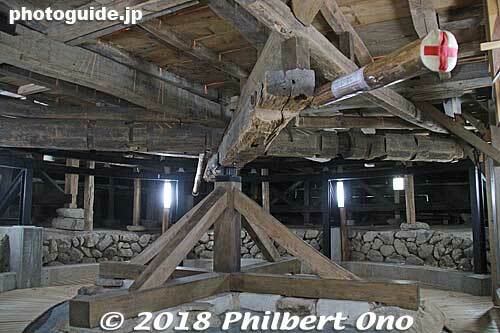 Toyooka was where the last living Oriental white stork in Japan died in 1986. Pesticides in rice paddies (where they feed) and other environmental problems caused their demise. In 1985, six wild Oriental white stork chicks from the USSR (Khabarovsk) were acquired to be raised in Toyooka. From 1989, the birds from Russia started to breed successfully in captivity in Toyooka every year. 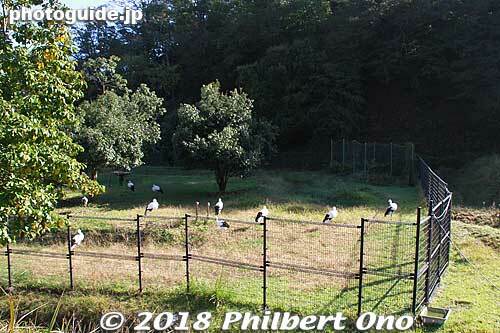 From 2005, the park started releasing Oriental white storks into the wild in Toyooka, which was a great celebration. The birds then started to breed and reproduce in the wild. They’ve been releasing only a few birds (fewer than 5) almost every year. 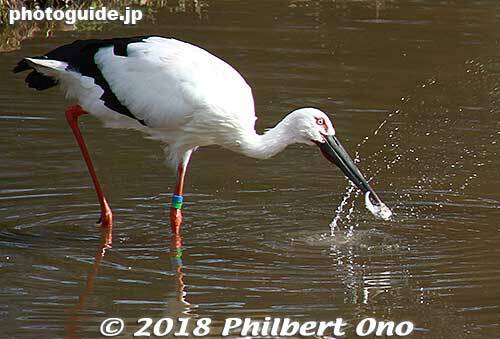 As of Oct. 2018, Japan has over 140 Oriental white storks in the wild. 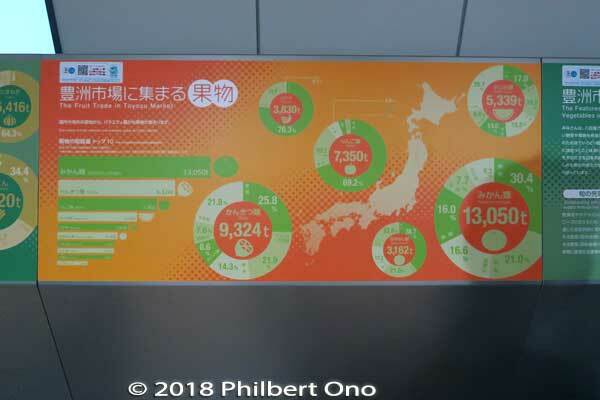 They are also successfully breeding in Tokushima, Shimane, and Kyoto Prefectures. It’s still an endangered species, with only slightly over 2,000 of them in the Far East. The Oriental White Stork Park keeps nine storks in an open cage (no roof), but their wings have been clipped. So all park visitors are guaranteed to see storks here. One half of the open cage has these terraced paddies where the park feeds the birds once a day. 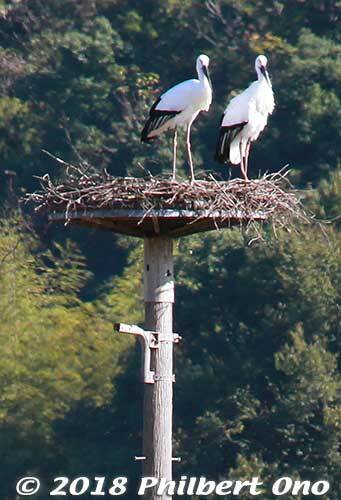 The storks are carnivores, feeding on fish, frogs, snakes, rabbits, mice, etc. The park feeds them mainly fish. The best time to visit the park is during the feeding time 9:30 am–10 am. 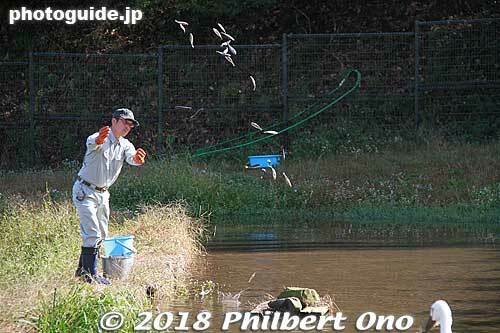 Park staff throw small dead fish into the paddies. The storks then go to the paddies and feed. A few wild storks also fly in to feed. Feeding time at the open cage for Oriental white storks. Flying in for some grub. 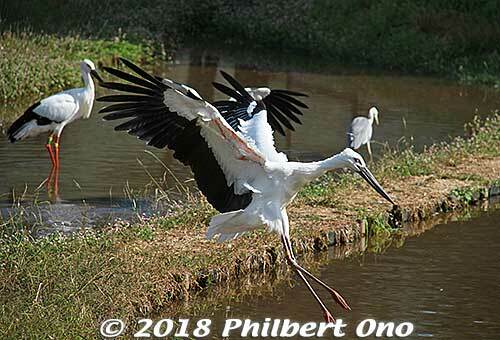 The storks’ feeding time also attracts unwanted birds like the grey heron (always fighting each other), crows, and black kites trying to steal fish. 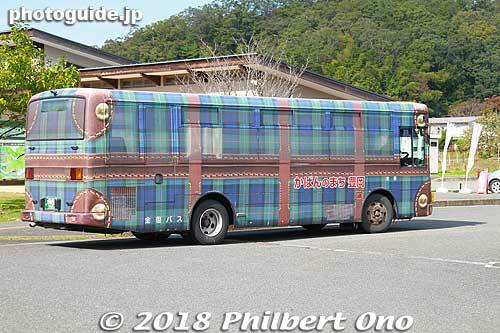 If you take a local bus from JR Toyooka Station to the Oriental white stork park, you may ride a bus that looks like a bag. 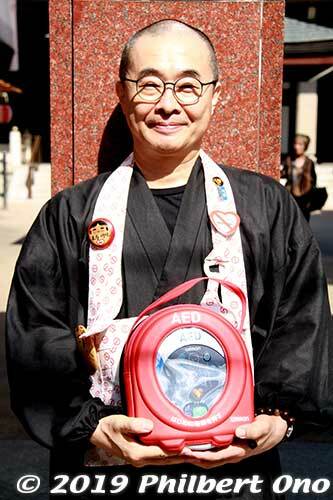 Toyooka is a major producer of bags. It even has a street named “Caban (Bag) Street” with a number of bag shops. 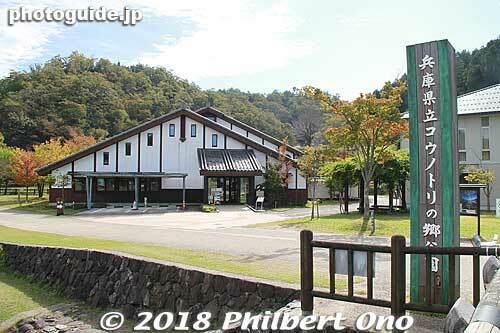 My next stop in Toyooka was Kinosaki Onsen (城崎温泉), only a 10-min. train ride from JR Toyooka Station. It’s one of the best onsen I’ve ever visited in Japan. 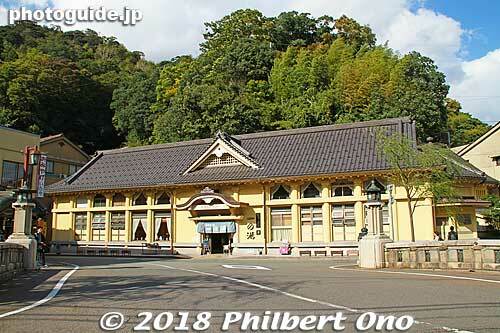 It’s picturesque, and the main highlight are the seven public hot spring baths (sotoyu 外湯). They are all distinctly different, the baths, decor, etc. A few of them look palatial. 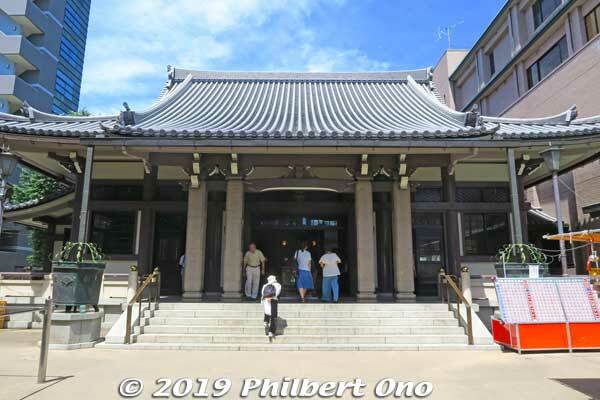 Guests who stay at a ryokan in Kinosaki Onsen can visit all seven public baths for free. 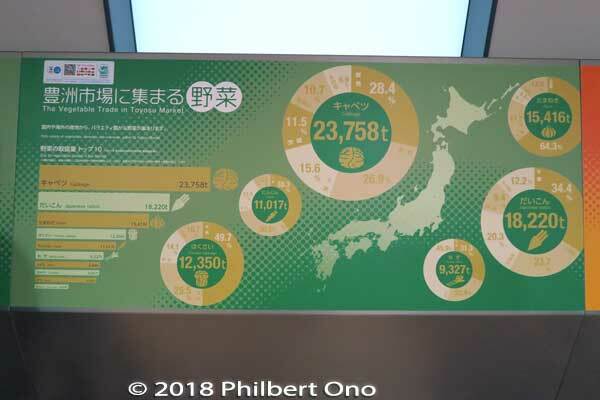 But daytrippers like me have to pay admission for each one, costing ¥600 or ¥700. 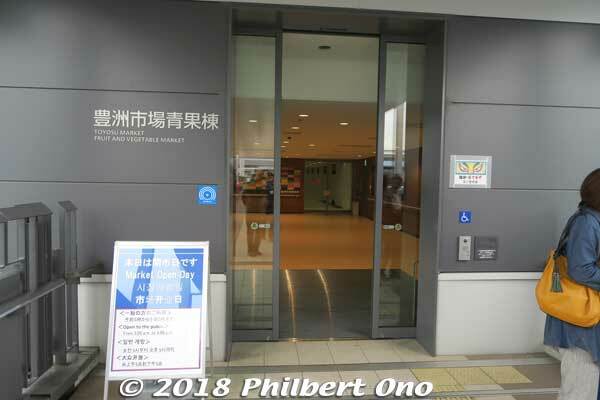 However, they have a public bath day pass for only ¥1,200 (外湯めぐり券). Use it to enter all seven. Great deal! Definitely one of the best bargains in Japan! 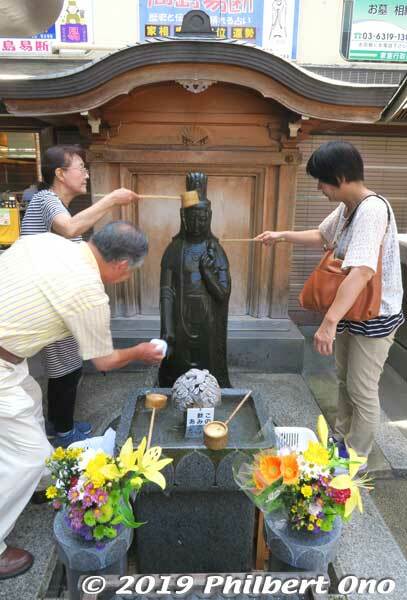 Kinosaki Onsen has a long history of 1,300 years. A favorite hot spring for centuries. Lots to see and do. 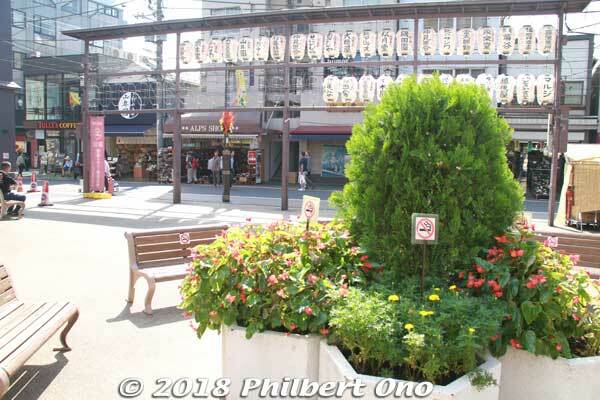 All the attractions are within walking distance from Kinosaki Onsen Station. Compact hot spring town. 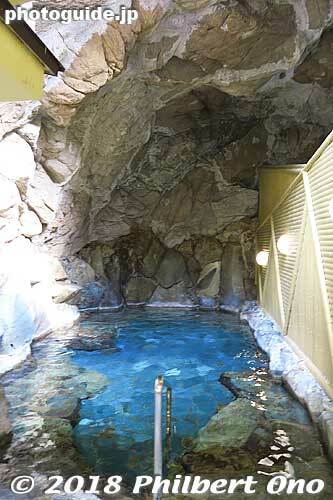 Ichinoyu’s outdoor bath is in a small cavern. 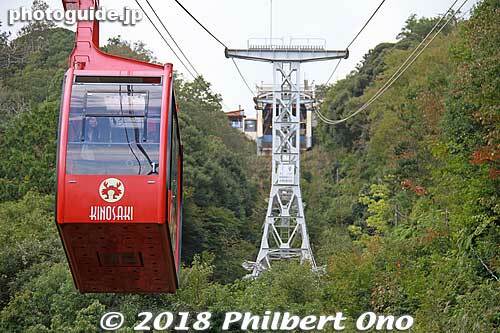 Kinosaki Onsen Ropeway goes to Onsenji Temple. 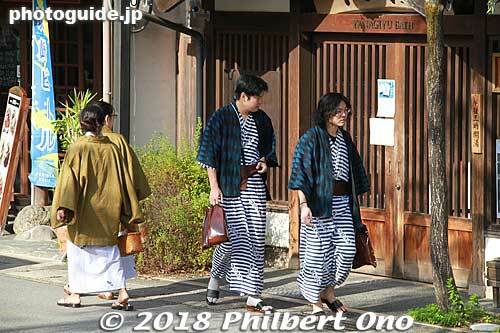 People are encouraged to stroll around Kinosaki Onsen while wearing yukata. 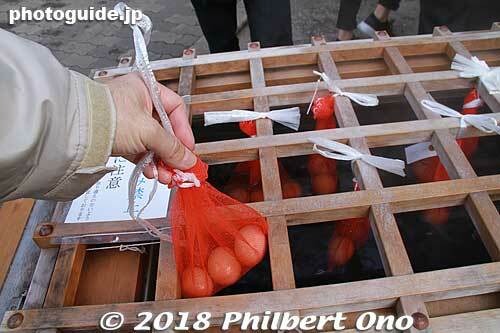 You can soft-boil your onsen eggs yourself in hot spring water. 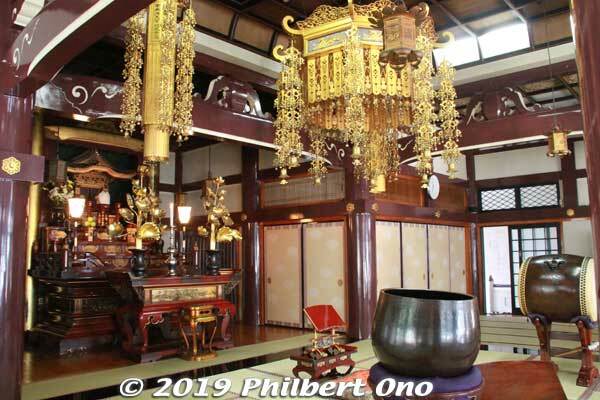 Another must-see in Toyooka is Izushi (出石), a short bus ride from JR Toyooka Station. 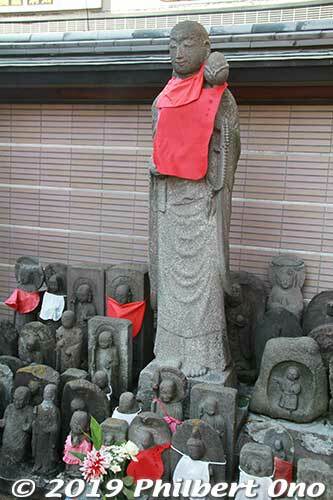 Izushi was town that merged with Toyooka. There’s the Shinkoro Clock Tower, Izushi Castle, and Eirakukan kabuki theater. 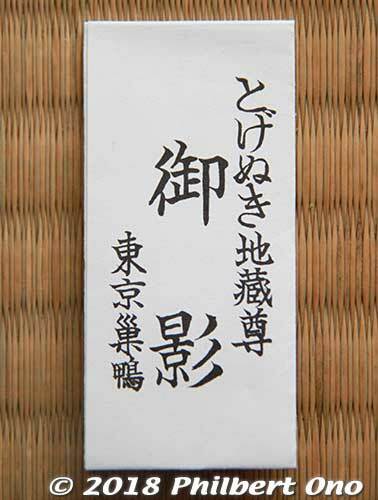 Izushi soba noodles are also the local favorite. 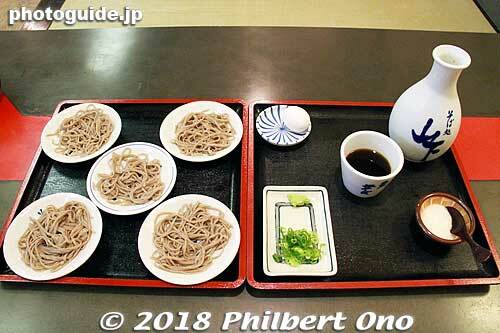 Many soba shops. 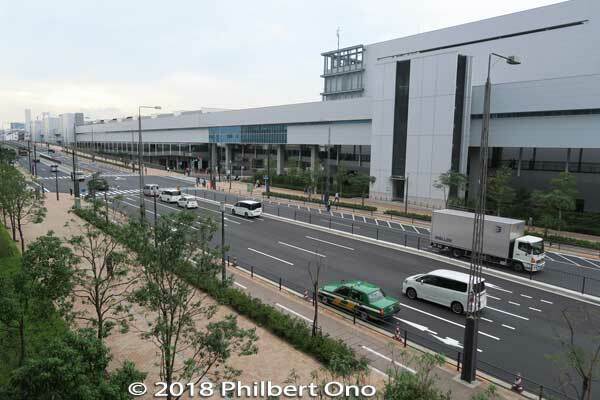 All the major sights are within walking distance from the Izushi bus terminal. 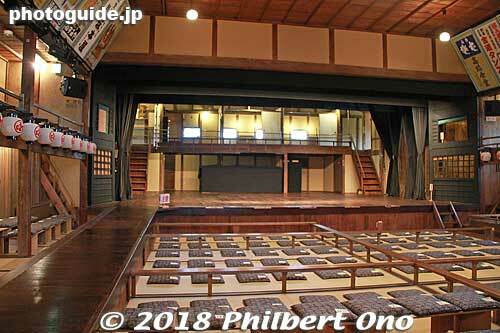 At Eirakukan, you can also go underneath the stage and see the revolving stage. It’s rotated by hand. 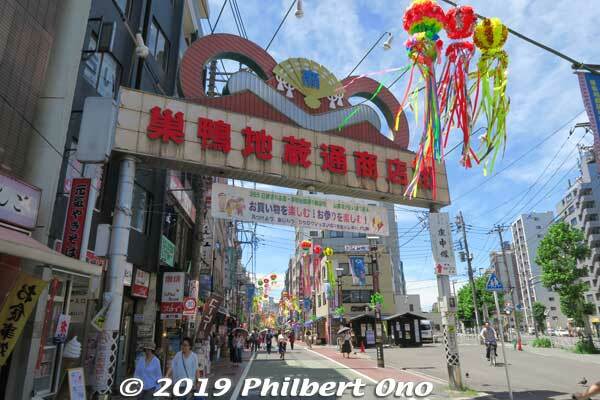 You should spend at least two days in Toyooka. 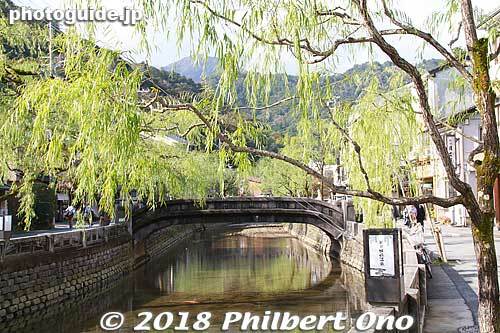 The Oriental white stork park and Izushi on one day, and Kinosaki Onsen on another day. 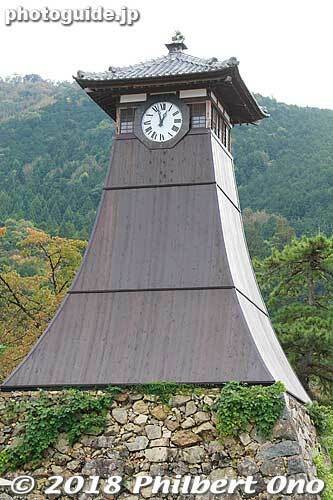 Toyooka Station also has the Kyoto Tango Railway that runs to Amanohashidate in northern Kyoto. Lots to see and explore in this area. 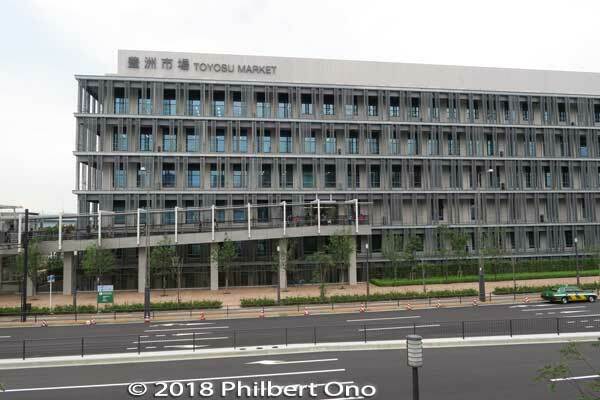 Visited the new Toyosu Market on the second day (Oct. 15, 2018) it opened to the public. 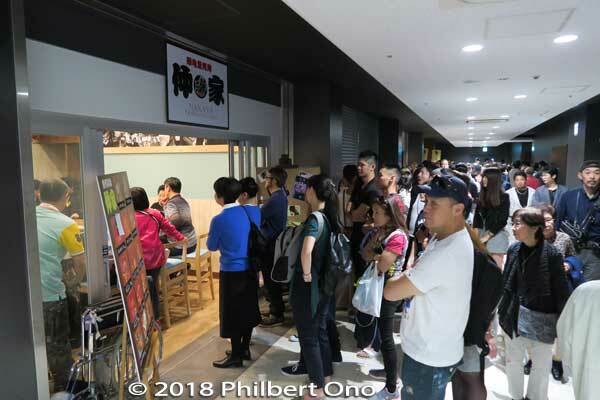 It’s proving to be massively popular among the curious and sushi lovers. 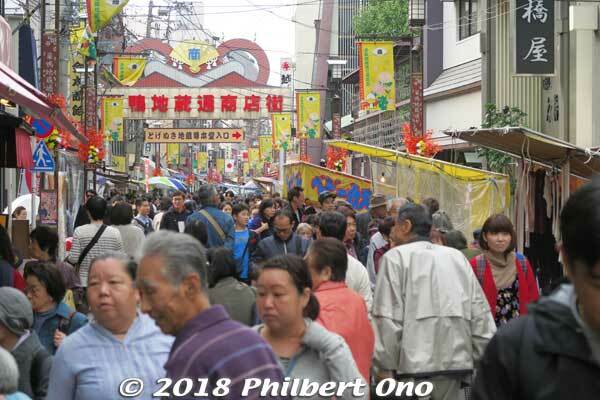 This blog post is for people who plan to visit the market. So you know what to expect. Toyosu Market is near Shijo-mae Station (seen on the left above) on the Yurikamome Line that runs between Shimbashi and Toyosu Stations. 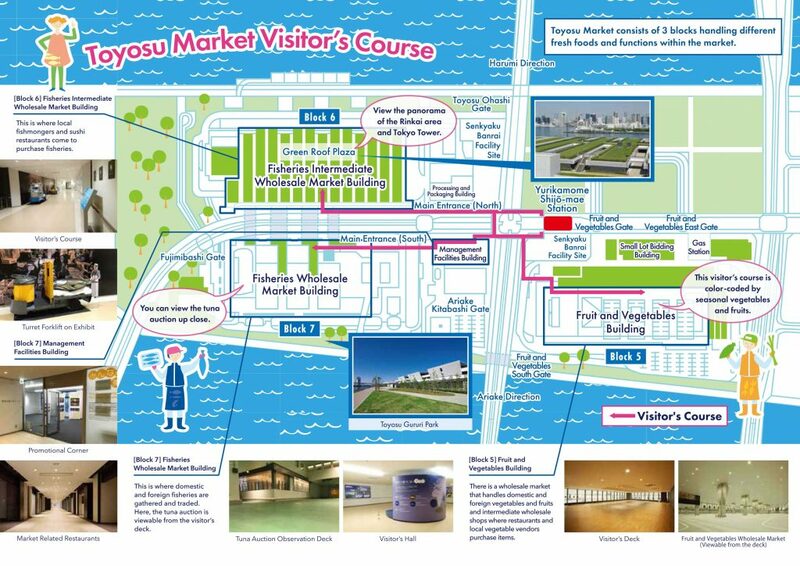 The official website provides this very basic map of Toyosu Market. 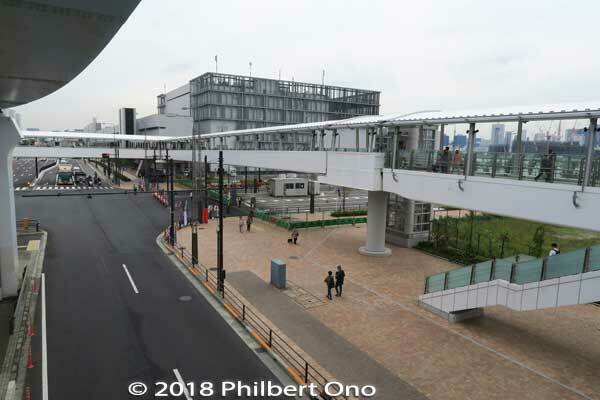 There are three blocks/buildings all connected to each other and to Shijo-mae Station via pedestrian overpasses. The red lines on this map show the pedestrian overpass to each block. 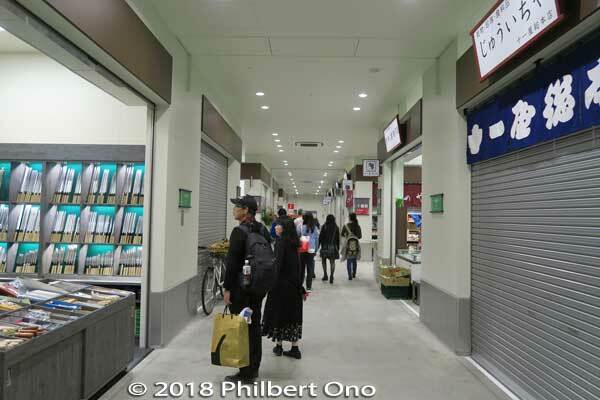 All three buildings have a long tourist corridor with picture windows to see inside the market. When the market is open (closed on Sun. 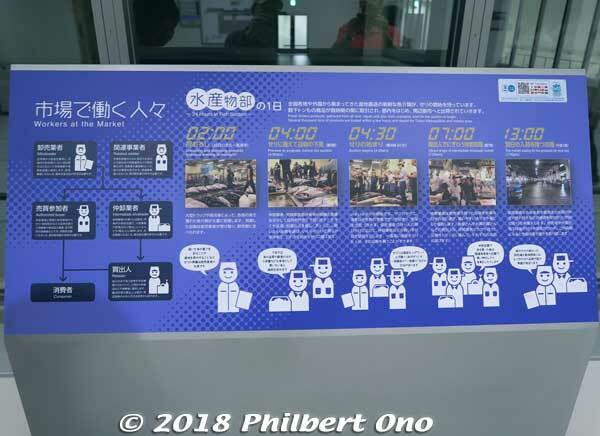 ), tourists can tour the three Toyosu Market buildings from 5 am to 5 pm. However, there’s not much market action after late morning. Besides the markets, there are sushi restaurants. The problem with this map is that it doesn’t show where the restaurants are. They are in Blocks 6 and 7. Very crowded though. 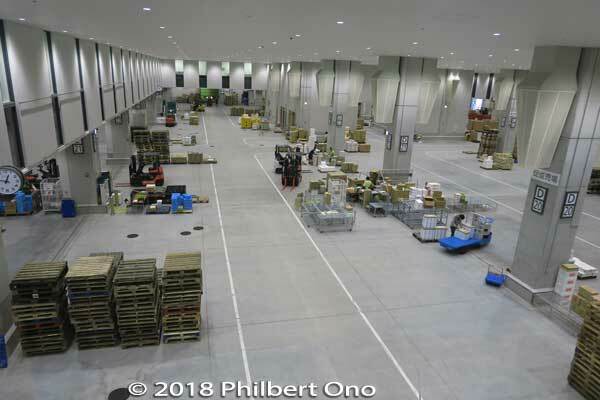 Block 7 is where the tuna auctions are held, but the public won’t be able to see the auction area until next Jan. But if you come here by 6 am or so, you should be able to see some tuna being hauled away on the floor. This block also has some restaurants. Block 6 is the largest building of the three. This is where the sold tuna is carved up. This building also has a large sushi restaurant area that is not indicated on this map. 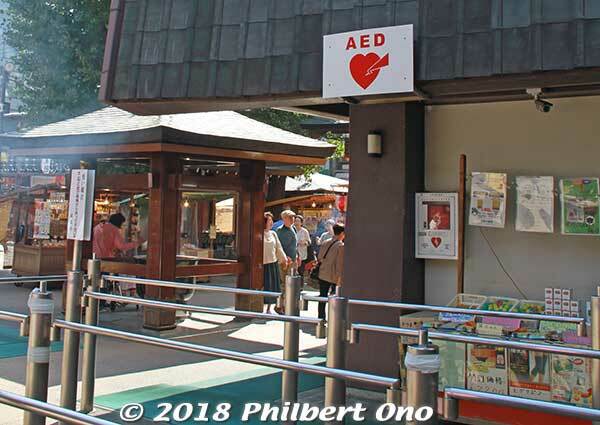 The upper floor also has little shops (Uogashi Yokocho Market) for people who work at the market. They sell knives, tea, etc., and also sell to the public, but the shops close by 2 pm or so. Block 5 is the fruit and vegetable market. Least crowded. No restaurants inside. 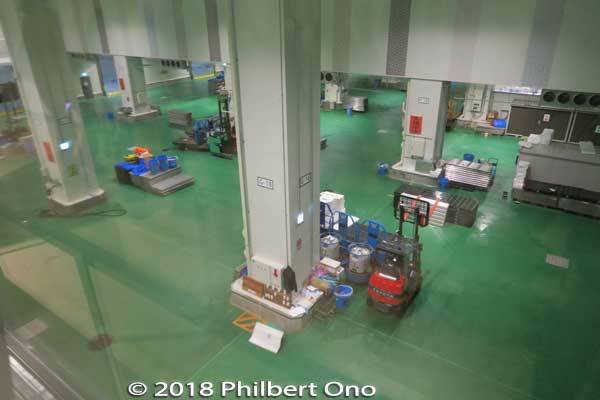 This is Block 7 where the tuna auctions are held. Let’s enter here first. 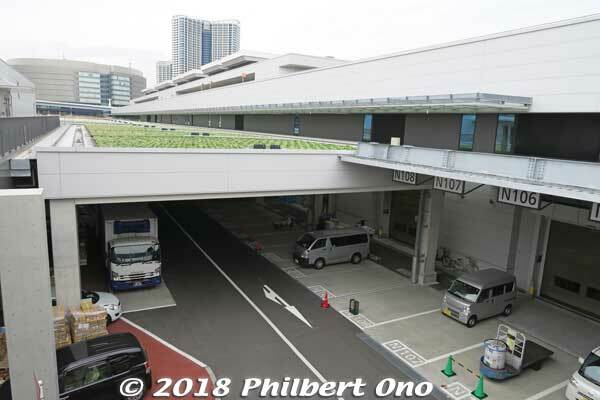 Notice the pedestrian overpass going into the building. 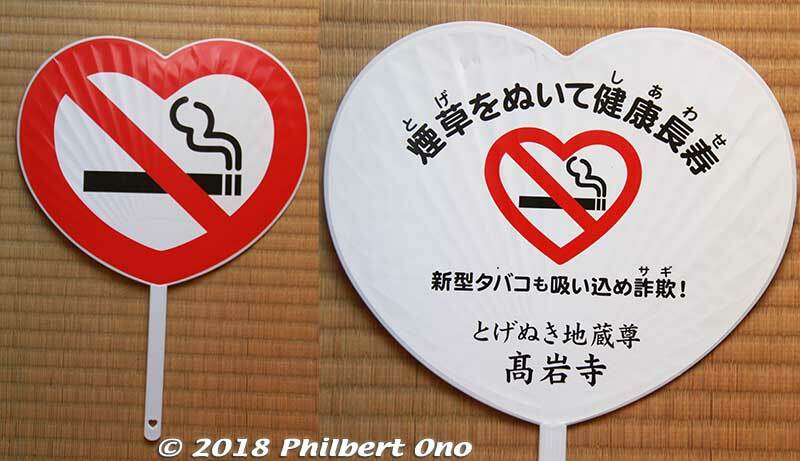 Directional signs for tourists are in Japanese, English, Chinese, and Korean. 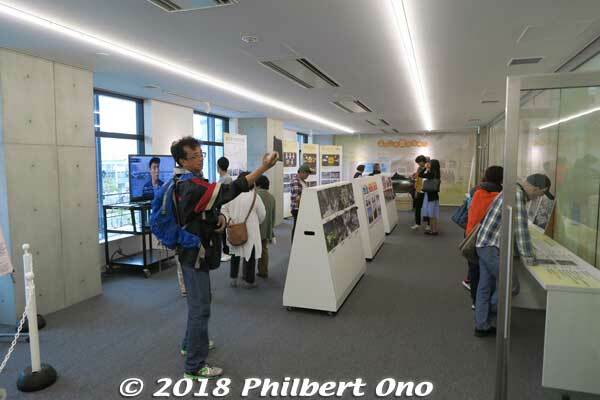 Block 7 has this small exhibition room with photos of the old Tsukiji fish market and other things. Exhibition room in Block 7. 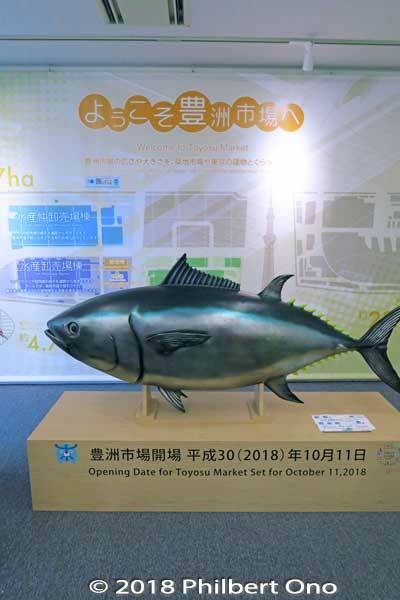 Tuna display in the small exhibition room in Block 7. 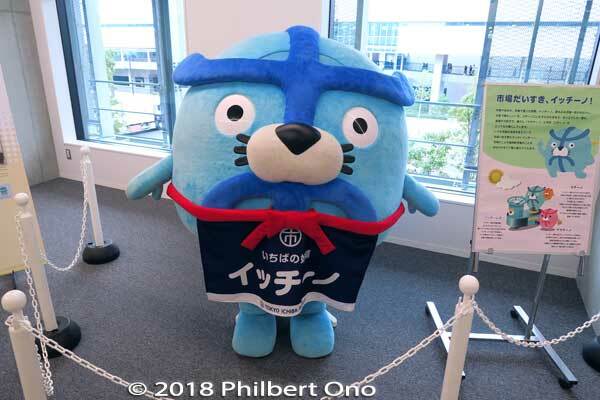 Toyosu Market’s official mascot: Itchi-no. 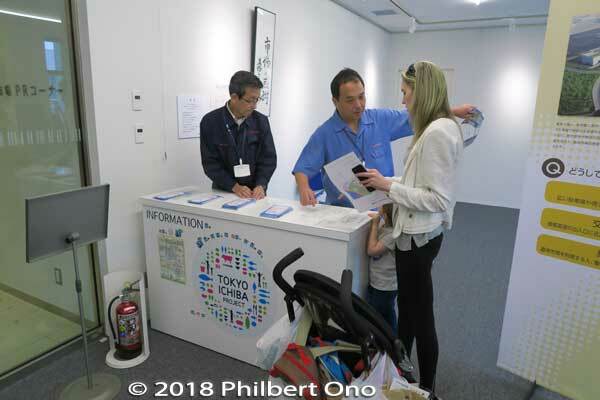 Information desk in Block 7’s exhibition room. Lots of questions from foreigners to staff who couldn’t really speak English. Another crowd-pleasing tuna display in Block 7. 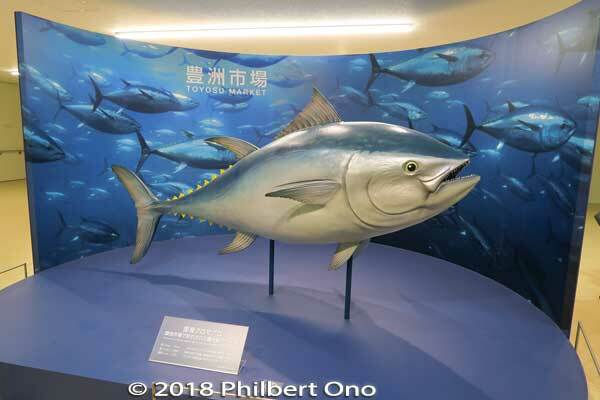 Life-size model of the biggest tuna ever sold at Tsukiji fish market in April 1986. 2.88 meters long, 496 kg. Didn’t say how much it sold for. 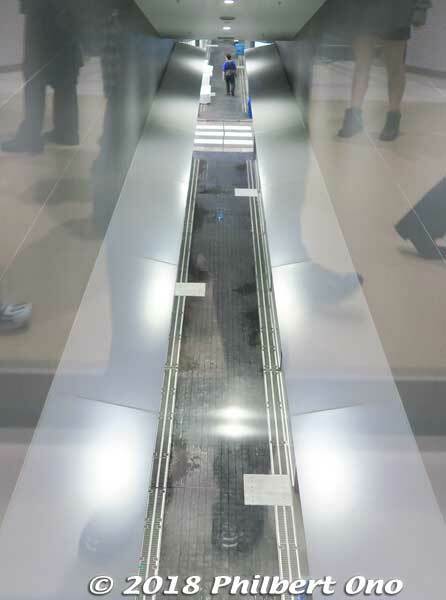 Block 7’s tourist corridor with glass windows to see the tuna floor. View of the tuna floor in Block 7. 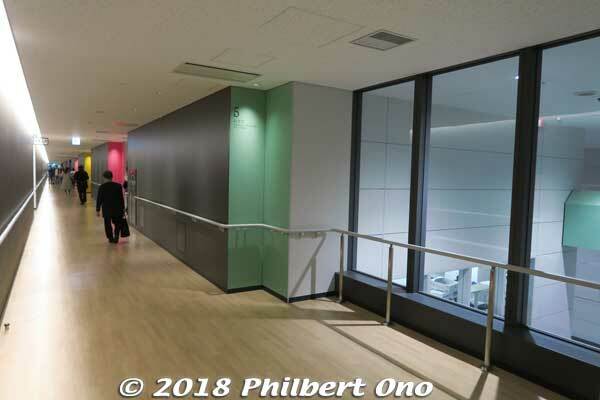 The floor was painted green for better contrast with the tuna’s red flesh to assess the quality. We visited around 2 pm, so nobody was here. You have to come here by 6 am or 7 am to see some action. 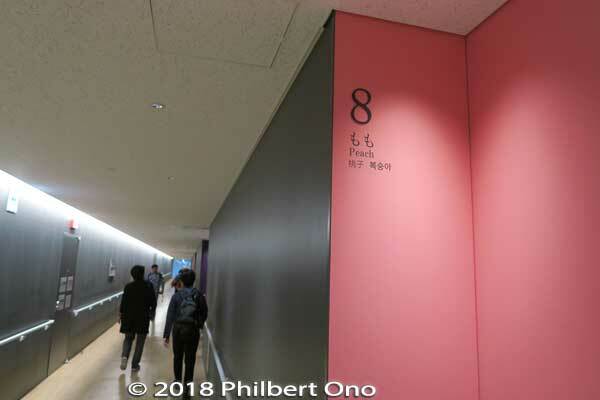 Nice bilingual (Japanese and English) explanatory panels in the corridors. At 2 am, they unload the tuna here. At 4 am, buyers examine the tuna and assess the bid price. At 4:30 am, auction starts. At 7 am, the buyers are busy hauling away the tuna. 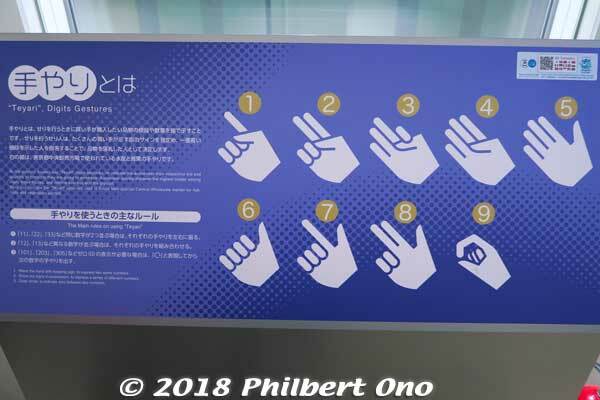 Hand signals to indicate numbers at auctions. By far, tuna is the biggest product the fish market handles annually at 21,692 tons (as of 2015). Block 7 has a restaurant section (not indicated on the official map). All crowded. Next is Block 6 where the fish is carved up and sold to sushi restaurants and supermarkets. This is the largest building of the three. Block 6 has this small entrance to the restaurant section. 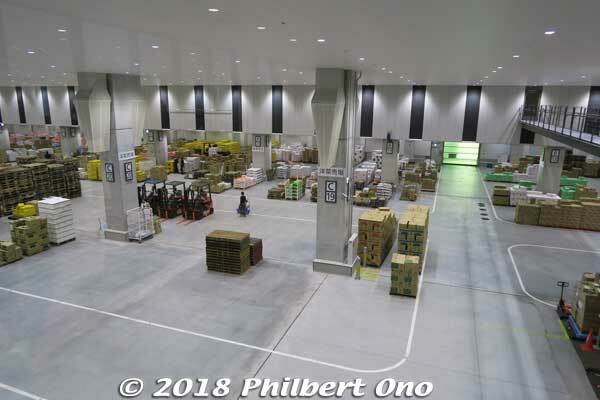 Block 6’s restaurant section is the larger one at Toyosu Market. 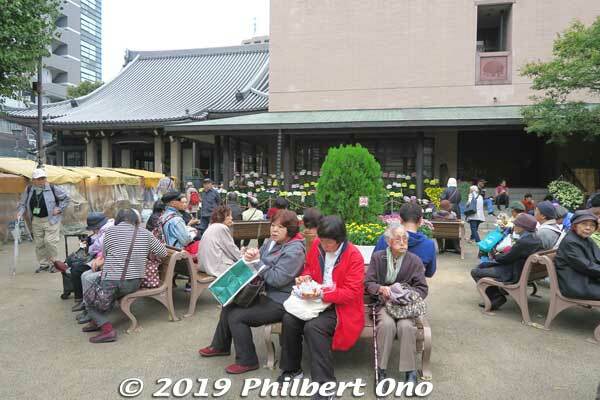 However, all the restaurants were totally crowded with people by 1:30 pm. 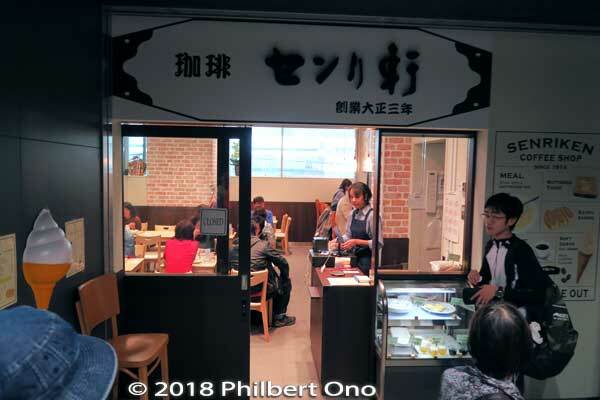 Many restaurants that were at Tsukiji moved here or opened a branch here. Wanna wait 1 to 2 hours for sushi?? Nope, but these people don’t seem to mind. 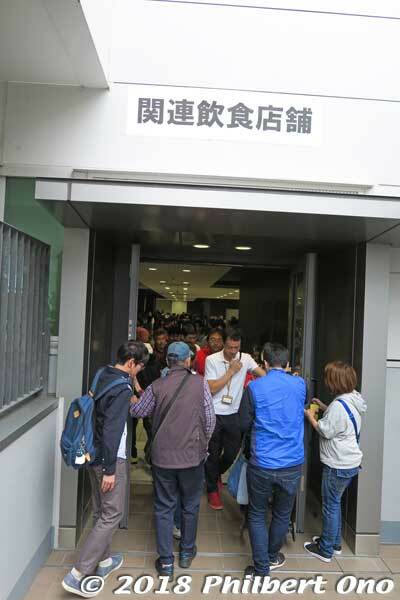 If you want sushi and don’t want to wait in line, go to the Tsukiji Outer Market instead. 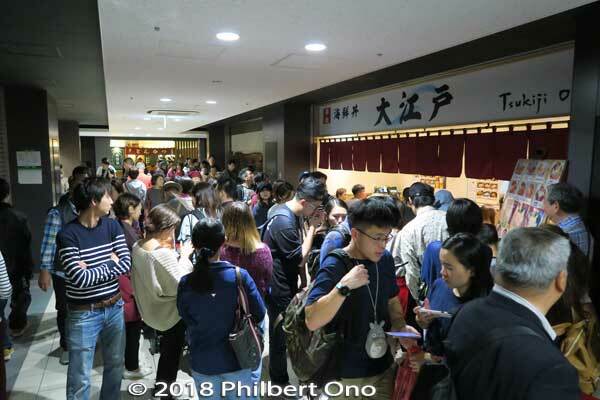 Long lines everywhere for sushi. 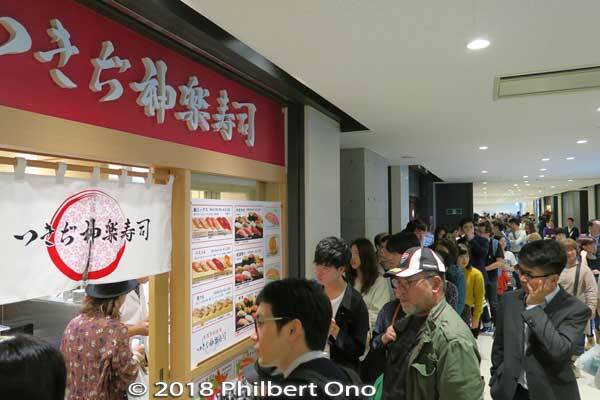 The restaurants usually sell out by 2 pm, then they close. 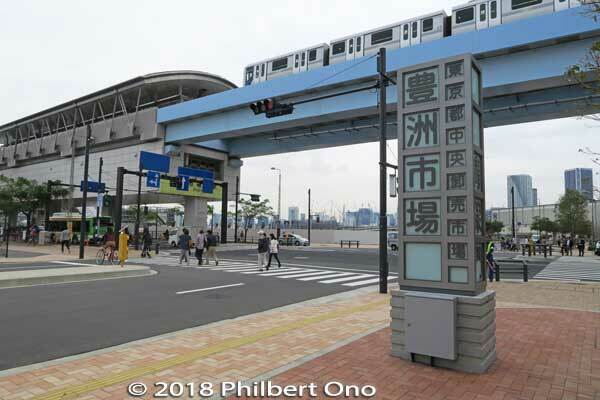 The huge crowd is either here for the novelty of a new attraction or they may be a strong sign of Toyosu Market’s massive popularity. 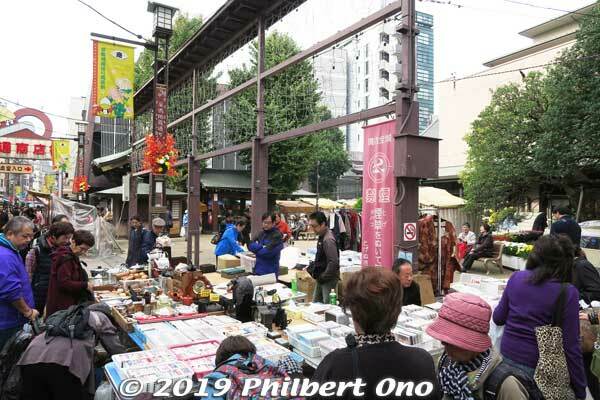 I’m afraid the Tsukiji Outer Market will soon be marginalized by Toyosu Market. 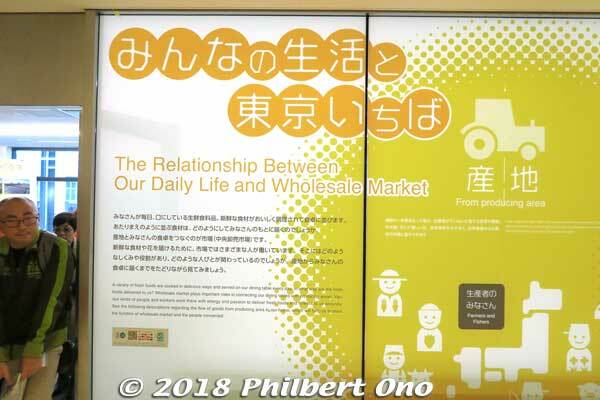 The market is the heart and soul, and it’s now in Toyosu. 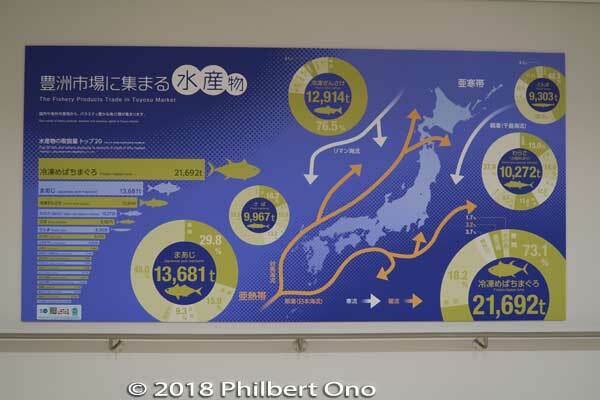 The fishmongers in Toyosu are very gung-ho now and really want the Toyosu brand to exceed the old Tsukiji brand. Only this coffee shop was not crowded. So we gave up having a sushi lunch at Toyosu Market. There are plans to build larger restaurant facilities in buildings adjacent to the market. However, they won’t open until 2023. After seeing the Block 6 restaurants, we walked along this long corridor and entered the market part of the building. 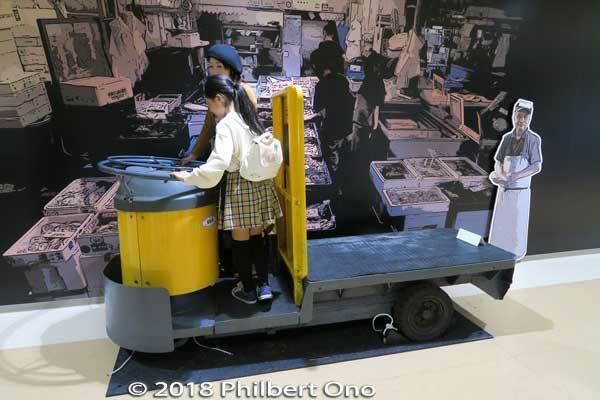 Block 6’s market entry hall had two turret trucks on display. Anybody could get on the turret truck and pose for photos. 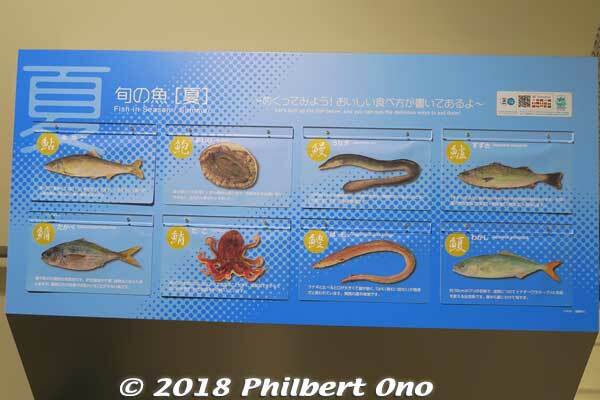 Also in the corridor, bilingual explanatory panels for identifying fish. Block 6 has many windows for tourists, but you can hardly see anything. 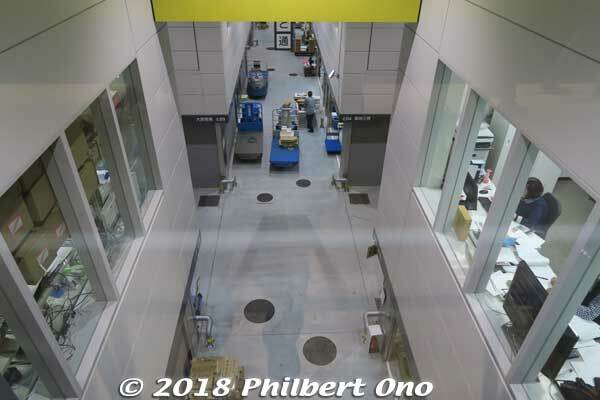 We can see just a small slit of the market floor. Just a pathway for the people and turret trucks, you don’t see the sellers. 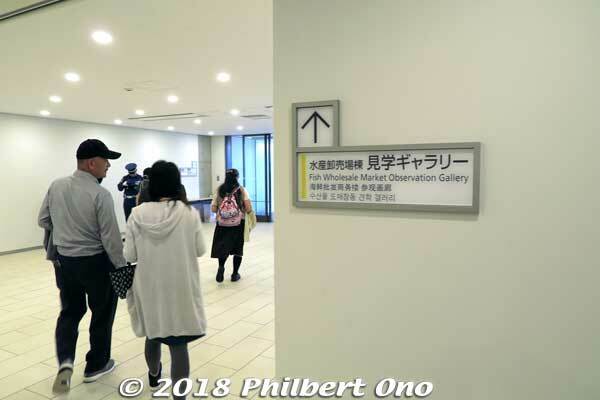 However, I was later told that there is also a viewing deck on the first floor where there is a better view. 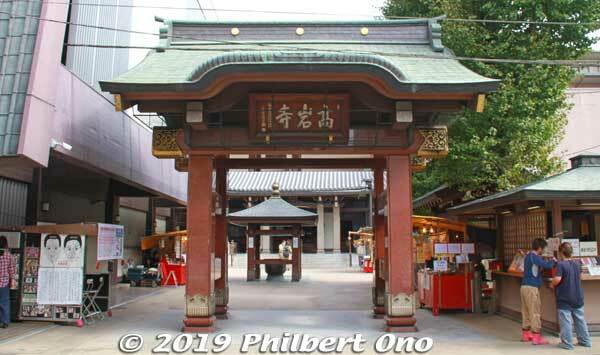 Block 6’s upper floor has a section of shops called Uogashi Yokocho Market. (This section is not indicated on the official map.) These are small shops catering mainly to market workers. They also sell to the public. However, by 2:00 pm most of the stores were closing. 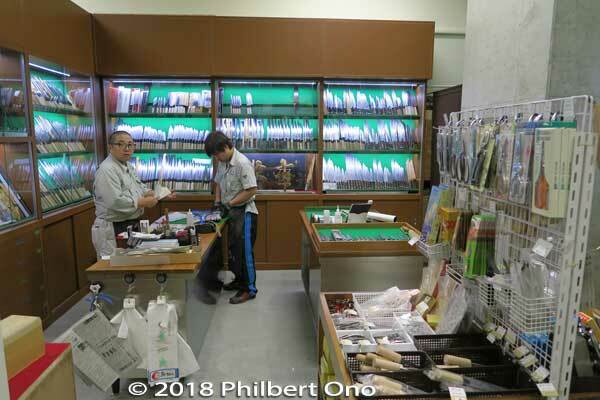 Cutlery shop in Uogashi Yokocho Market. 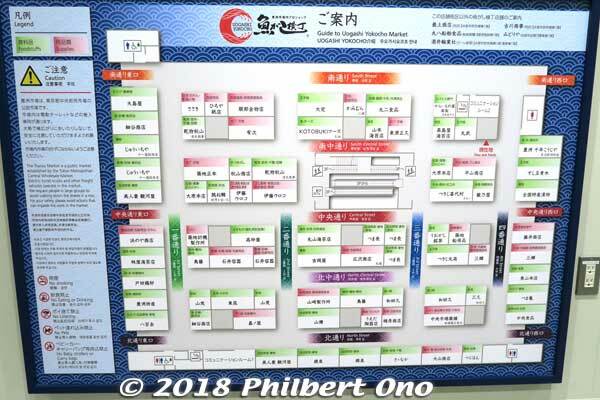 Map of Uogashi Yokocho Market in Block 6. Lots of little shops. 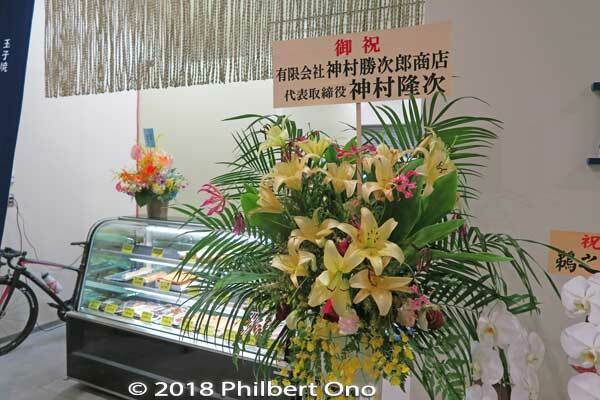 Many of the shops had congratulatory flowers for their grand opening. Lastly, this is the fruit and vegetable market, Block 5. Entrance to the fruit and vegetable market. 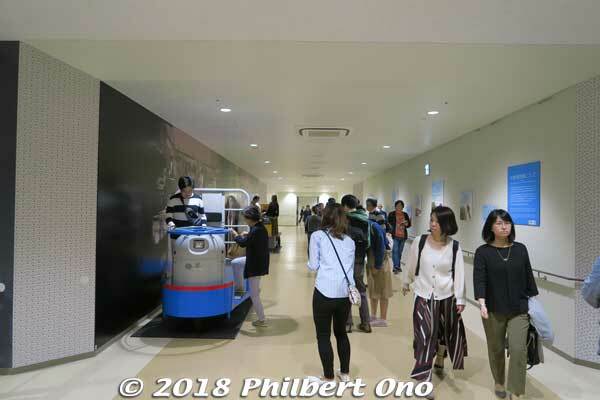 The observation corridor for tourists inside the fruit and vegetable market. Lots of windows, but they don’t show much. 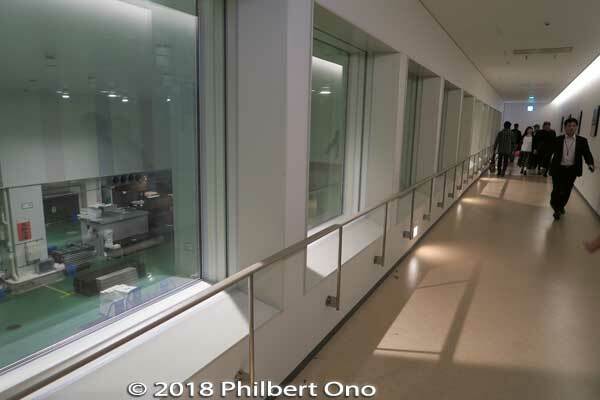 Each observation window was color-coded and named after a fruit or vegetable. A nice touch. Not much to see though. 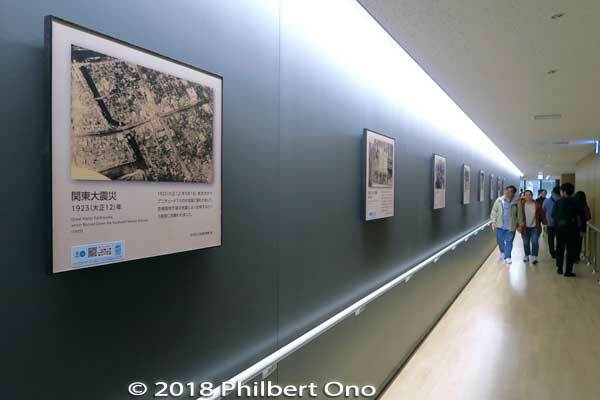 Corridor wall also had panels explaining the history of the food and vegetable market in Tokyo. 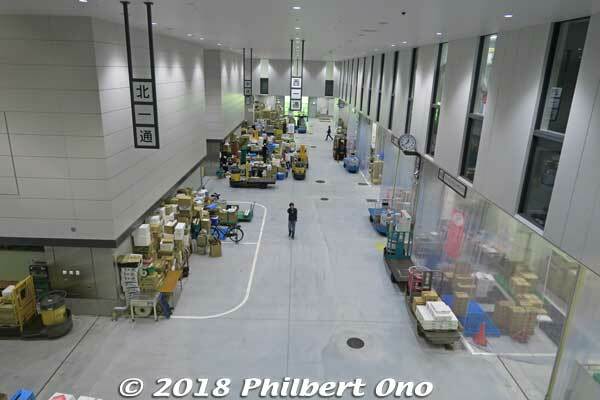 Better view of the fruit/vegetable market toward the end of the corridor. 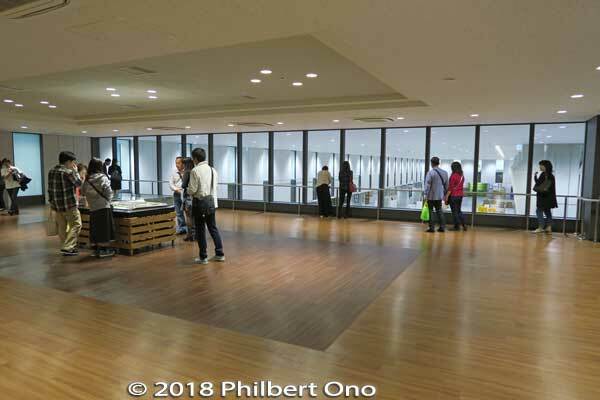 At the end of the corridor, there’s this big observation deck where you can see the wholesale section of the fruit and vegetable market. Not much action in the fruit and vegetable market since it was in the afternoon. The fruit market’s biggest item is mikan (tangerines), then citrus. 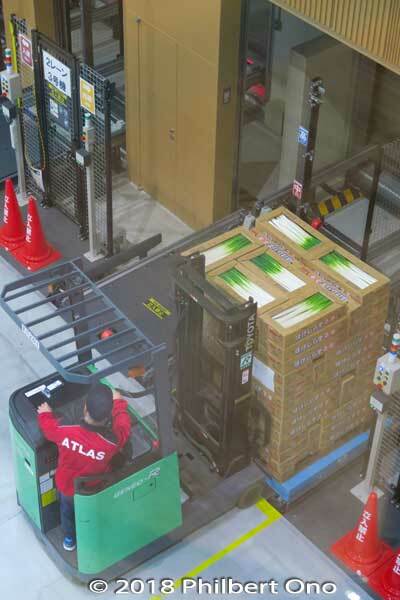 The vegetable market’s biggest item is cabbage, then daikon. 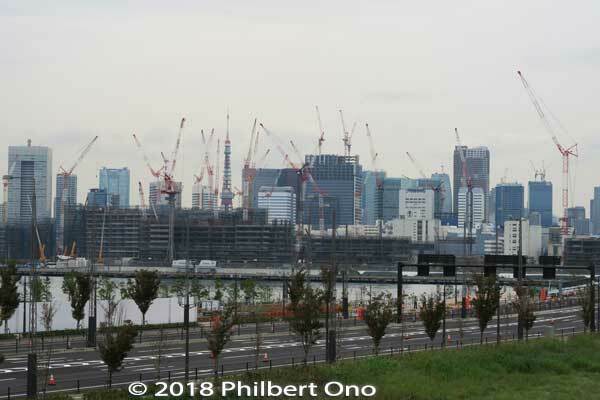 Across the water from Toyosu is the Tokyo Olympic Village under construction. Since we couldn’t eat sushi at Toyosu Market, we took the train to Toyosu Station two stops away and had a late lunch there instead. 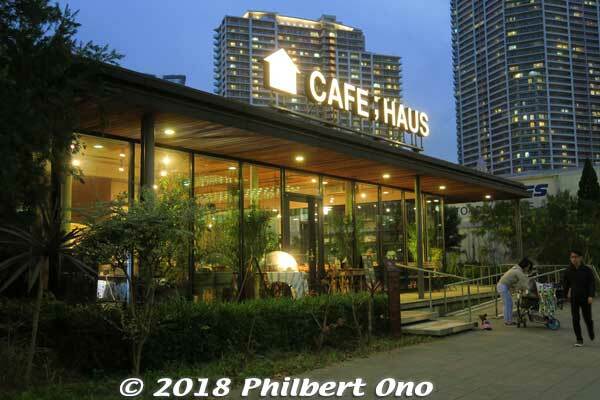 Near Toyosu Station is a restaurant called Cafe Haus. It’s a good restaurant. At least we ate in Toyosu. 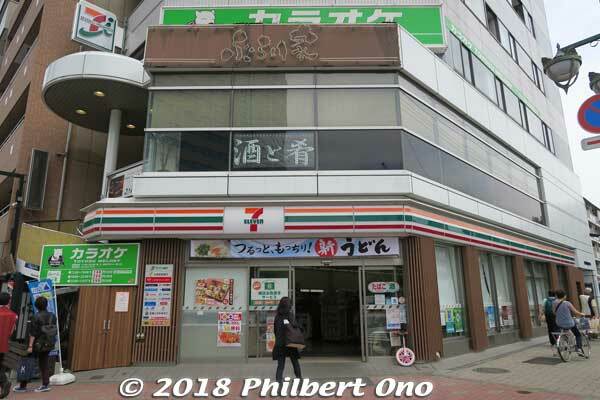 On a street corner near Toyosu Station is where 7-11’s first store in Japan opened in 1974. It’s still operating here in the same building. 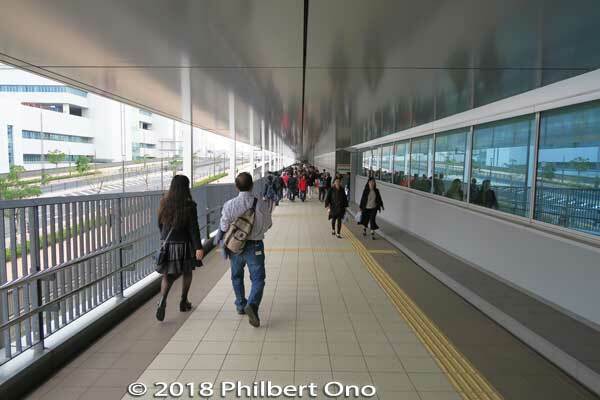 Toyosu is quite a new, modern town. Lots of construction still going on. It’s turning out quite well.